Roadway and utility construction has begun on the final phase of estate-sized homesites in the master-planned community of Palencia. The Garcia Institute, the premier facial plastic surgery center in Jacksonville, has just announced the Grand Opening of The Garcia Institute of Palencia. World-renowned golf players and local teams recently came together to raise more than $160,000 at the 19th Annual Monique Burr Foundation for Children, Inc. Pro Am Golf Tournament. The Inaugural AT&T presents Monique Burr Foundation for Children’s Champions for Child Safety Pro Am will tee off on Monday, Dec. 1, at the Palencia Club in St. Augustine. New home and home site values at Palencia have increased by 13 percent and 58 percent, respectively, over the past 12 months, and given the dwindling supply of estate lots throughout Northeast Florida, continued price increases are expected. A one-of-a-kind pirate ship playground has re-opened at Palencia in St. Johns County. A unique residential/retail Village Center at Palencia in St. Johns County has added five retailers this summer and the community now has more than 30 commercial businesses operating in the hub or at other locations. CornerStone Homes has completed the construction of a striking new, award-winning, five-bedroom model home in the expanding, master-planned community of Palencia in St. Johns County. 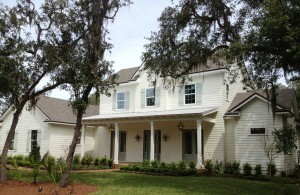 The Cottage Home Co. has completed construction of a new model home in the growing, master-planned community of Palencia in northern St. Johns County, a beautiful two-story home that features a second-floor balcony off an upstairs game room.